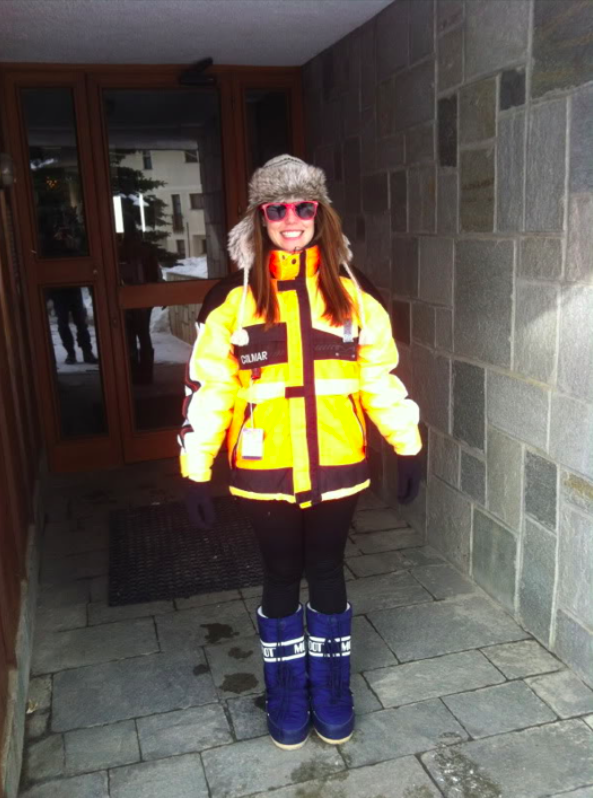 Besides bringing my snowboard (with a gold grill on the bottom, oh ya) to the Alps this New Years, I also brought my Moon Boots! That’s right, hard to believe. They are made by Tecnica, which makes shoes and boots for extreme sports. These oversized pieces of foam can walk through anything. I had a pair of tall Sorels and North Face snow boots when I lived in Boulder for 14 months, but in the end the Moon Boots won! Uggs are great too, I just won’t wear mine in the snow… they get too dirty and wet. So, before forking over $100 or more on boots try on a hot pair of these babies. easy to put on, hands free! Last year we drove straight to the Alps, but this time we took a train from Florence to Torino (Turin) before heading to the mountains to explore Torino for two days. When packing, I realized I had to wear them on the train, since they are too bulky to pack. Many strange looks were directed my way. Now that we finally made it to the Alps I won’t stick out like a sore thumb—as much. 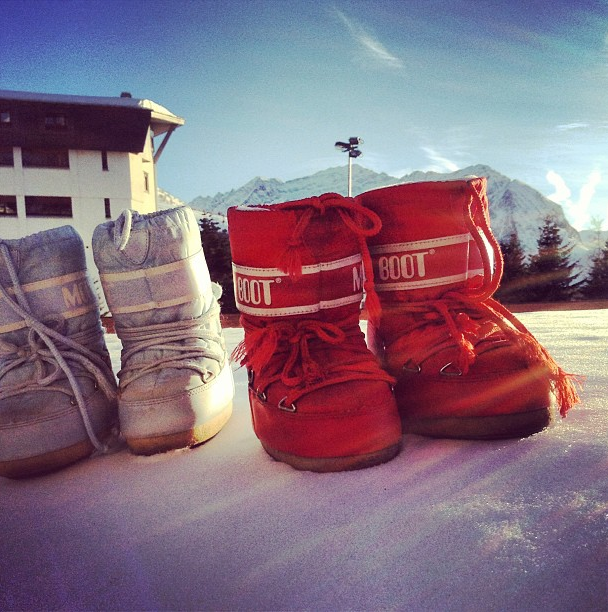 When the snow starts to fall in the Italian Alps the Moon Boots start making their appearance. You can’t put a price on being warm and these are the cheapest and warmest pair I’ve ever owned. They are well priced starting at 40€ ($53) and can go up to 100€ or more depending on the color and material. I just wish they were more popular in Colorado and across the States. Get a pair if you can find them, they’re the best! and let’s not forget the kids! 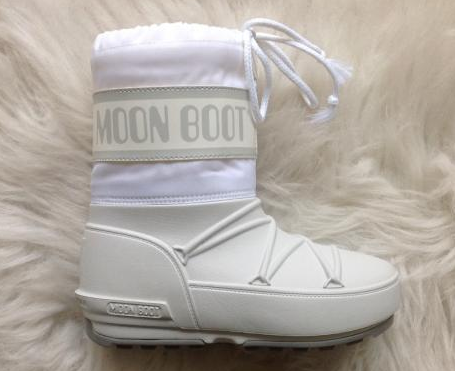 Are you a Moon Boots fan or foe? 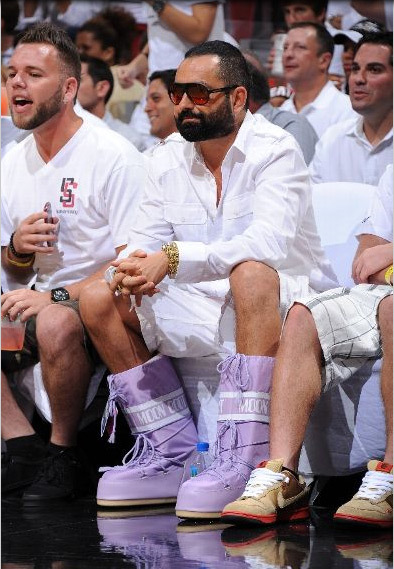 Tena have you seen this dude at any games wearing Moon Boots!? LOL! No! How could that go missed though! Wow! Happy to see you kids are finallyyyyyyy catching up to us ole geezers!! N u didn’t think we were kool!?! Mom’s are always cool! These things are amazing! Who would have thought? I saw them in the Nordstrom catalog last year and loved them but never knew I could wear them to HEAT games! Haha, go for it! They are cozy. WARNING your feet may melt while wearing them in Miami. Ha ha love this, Moon boots are cute! I’m officially impressed, and it would feed into my love affair with Space, so the next time I’m headed for cold weather, I’ll know what to get! Haha!! You will feel like you are walking on the moon, so you will love it! I finally retired mine for the season two weeks ago. I can’t wait for the snow to start falling again. Let me know what you think if you get a pair!